Nora Lighting clear acrylic LED EXIT light. AC ONlY. 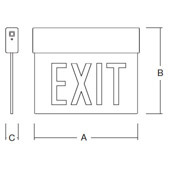 Brand: Nora Lighting NX-506-LED EXIT Light. AC ONLY. Energy Star Compliment. Acrylic single face has rounded and finished edge for attractive appearance. Red or Green 6" lettering inside face. Voltage: 120V or 277V dual input. Power consumption: 3 watts normal/ 5 watts emergency operation. Testing: High-charge/ ready operation indicator light and Test button. Life Expectancy: LED and PC circuitry are rated for approximately 25 years with no change in illumination level. Circuitry Protection: Isolated surge/ short circuit protection and Disconnect for deep discharge. Housing: Universal mount to wall, ceiling or side. 2-Piece snap-together aluminum extrusion holding battery, LED source, PC board, and top of acrylic face. Approvals: UL924, NEC, NFPA, State& Municipal. A=12 7/8", B= 11", C= 1 7/8"